This was the first year we've gone to a pumpkin patch. Last year AC was almost eight months old, and we thought it was probably best if we waited another year. Little did we know we would have another infant this year, but we decided to go anyway. 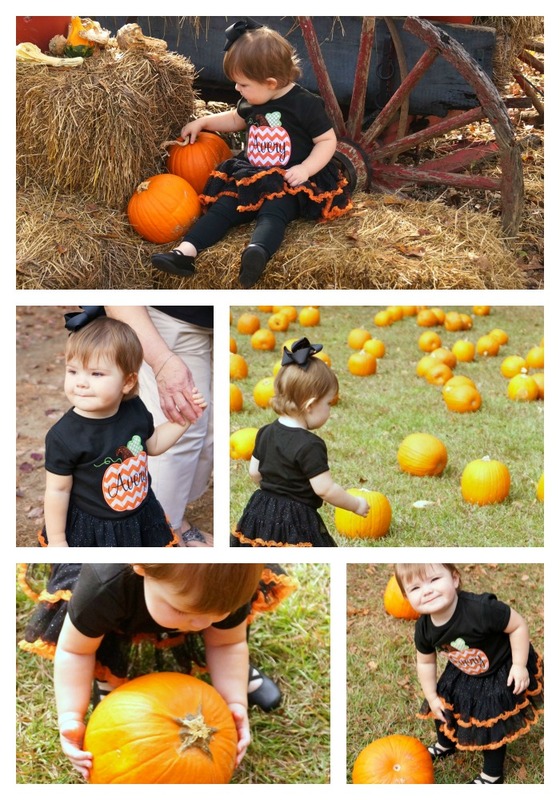 We decided on a pumpkin patch a few miles down from us. They had a train that took you about fifteen minutes away to a "pumpkin patch" to gather your pumpkin and enjoy all the stations for kids to play. 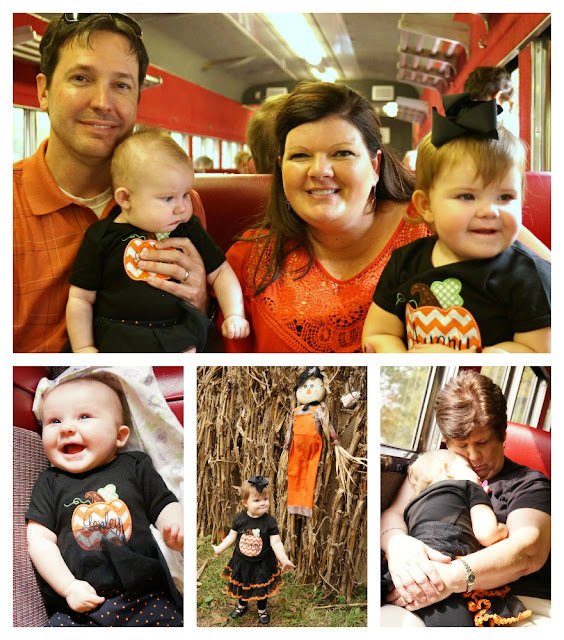 There was a corn maze, jumpie, hayride, face painting, bubble station and more. We did a few of them, but AC was having more fun watching everyone and running around, so we let her have her own kind of fun. LP passed out right after we got there, so no family picture. We managed to get one of Ganny and the girls before her nap. 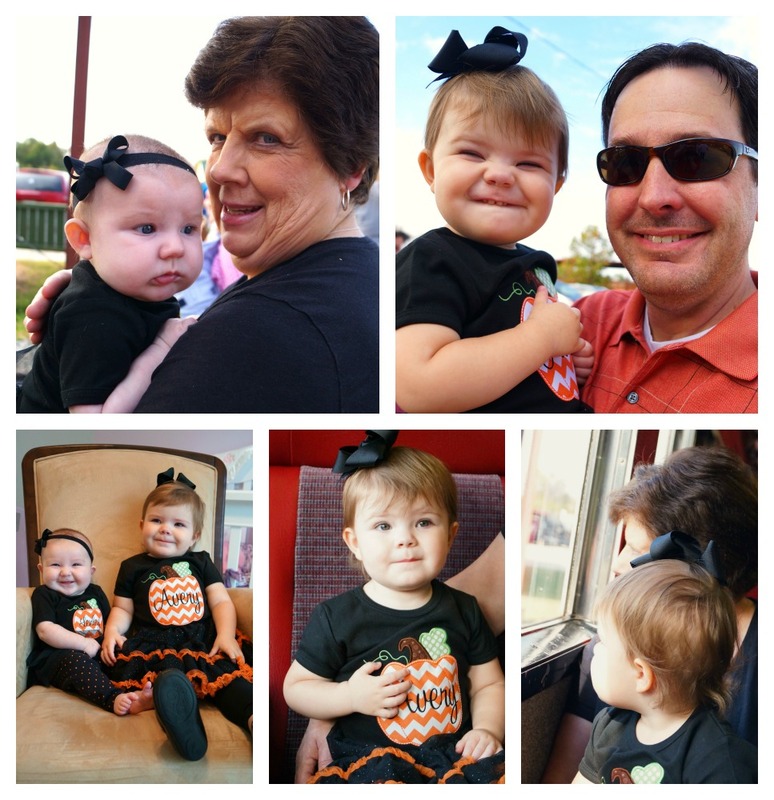 AC loved the train ride, but she and Ganny fell asleep on the ride back to the train station. LP laughed, kicked and squealed there and back! Next year we might try one of the pumpkin patches further away that has more, like a petting zoo. Both girls will be walking and I figure at a fun age where Terry and I are chasing both of them. 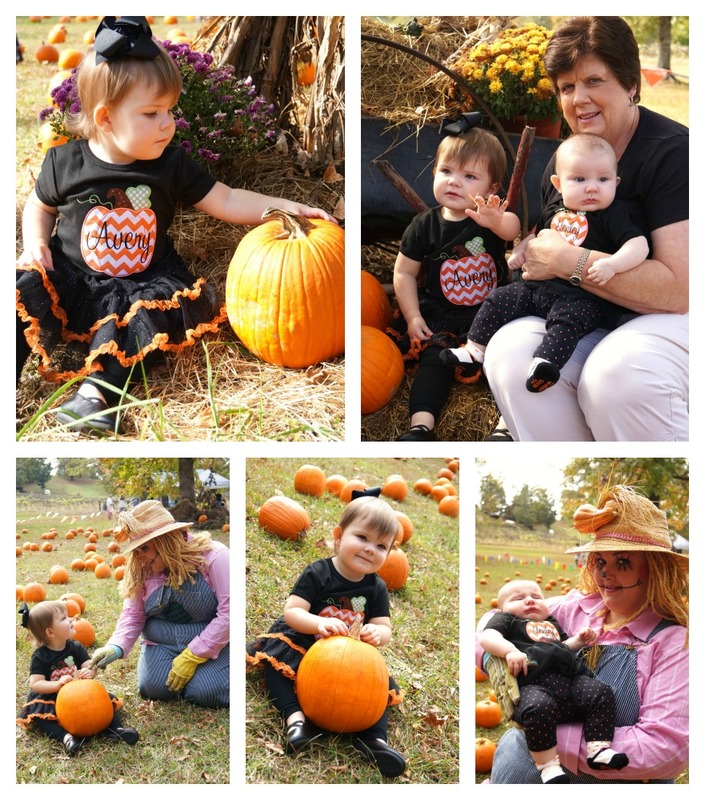 Thankful for the memories that were made for their first pumpkin patch trip! Enjoy all the pictures below! The drive down was rough. We still didn't know at the time that she had reflux, and she screamed 90% of the way there. Arriving late that Thursday night, we unpacked and tried to get some rest so we could enjoy the next three full days at the beach. 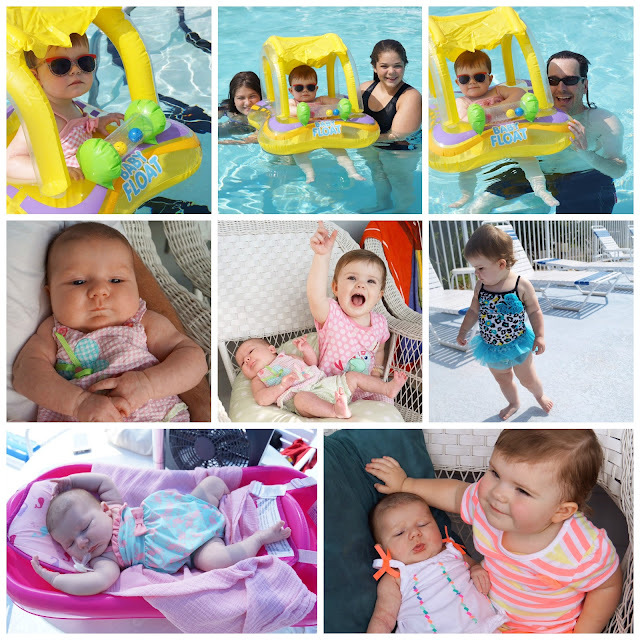 AC enjoyed swimming with her daddy, while LP enjoyed sleeping in her bath tub under an umbrella with a fan blowing on her. This was the norm for all three mornings. Then in the afternoons, we napped before getting ready for dinners out on the town. We hated to leave, no seriously we hated to leave because we knew the ride back would not be fun, but we had to get back to reality. 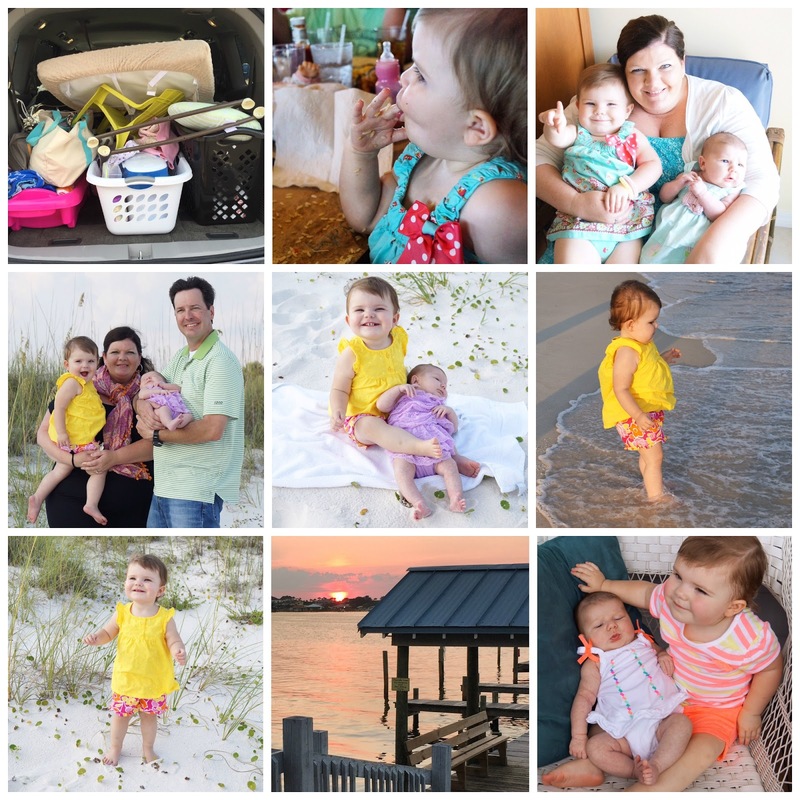 Enjoy some of the pictures from our beach trip. I'm thinking next year's pictures and activities will be hilarious having two walkers! I realize it's been quite awhile since my last post, and I can't promise I will be able to update on a regular basis, but I will try to do better. Having two littles ones is a demanding, yet wonderful job. At my thirty-eight week appointment I told the Mr I couldn't go on much longer. We had already scheduled her birth for June 29th, but we were a few days from that date and I was ready! As we sat in the waiting room to be called back, I told him tomorrow is the day. Once we were called back, I'm pretty sure every nurse we passed knew it too. For six weeks at every doctor's appointment we had an NST (non stress test) which monitored the baby for thirty minutes. I was very thankful for that last NST at our appointment that day because I hadn't been able to feel her much, and as a mother who is carrying a baby that can be the scariest feeling and will make you worry to death. It took the nurse a few minutes to find her heartbeat, but once she did I was relieved and tried to relax and enjoy listening to her heartbeat. My blood pressure was really high, and my ribs were in constant pain. So when my doctor came in and asked how everything was going, I didn't hold back. Thankfully, she knew it was time, too. And with all of my crazy vitals and having trouble feeling the baby, she said let's have a baby tomorrow. The Mr said I immediately relaxed and smiled after hearing those words. She told us we would have to be at the hospital at five the next morning to be admitted and prepped for surgery. I told her no problem. And I'm not a morning person. Just ask Terry. After a full day of running errands, and getting a last minute mani/pedi we finalized our bags and went to bed. I got maybe an hour and a half of sleep before the alarm went off at three. And as soon as I got in the shower, I realized I was hurting. I was having contractions. We managed to arrive at the hospital and got to the labor and delivery floor a few minutes before five, and shortly after we were settled in our room. The nurse was quick to get my IV in, and on the first try I might add. (She's a rock star for that!) After a few thousand questions, and the signing of what seemed like hundreds of pages, I was ready. I strictly remember one of the questions... how many pregnancies and how many babies? Well, I answered three and three. She gave me a look because it wasn't agreeing with the paperwork she had on hand (three pregnancies/two babies). After I saw her puzzled look I quickly answered, this is pregnancy number three, one baby is in Heaven, one is at home with the grandparents and one is about to be born. A few minutes after seven, Dr. Gooding came in to tell me she was rallying the troops to get it started. The nurse anesthetist came in to talk to me about how everything was going go, and how it would be different from last time. (If y'all remember, last time was rough with the spinal block.) And she assured me that she would do any and everything she could to help me relax and be comfortable. A few minutes later, I was being wheeled to the OR. This time it was different, a lot different. There weren't as many people in the OR as last time. I didn't hear people counting, it didn't seem to be so chaotic. The OR table was as tiny as I remembered, and cold which I was fine with. It wasn't long before the anesthesiologist came in and said we were about to get started. Since it took three tries last time, I was trying not to panic. Thankfully, this anesthesiologist was very nice helped me get calmed down and stay calmed down with the help of an outside guest (and that's really all I can say about that). One stick of the numbing medicine (which hurt the worst) and the next thing I know he said, it's in... lay her down. WOW! Nothing like it was last time. Only this time, I started panicking quicker about the heavy feeling in my legs and not being able to move them. I'm talking really panicking. Thankfully the nurse anesthetist calmed me down and told me as soon as the baby was out, she would give me something to relax so I wouldn't think about that feeling. She also kept telling me that I would feel like someone was pulling me, but the only feeling I remember was like someone was rocking me from side to side at my waist. It was weird, but it didn't bother me or hurt me. And then I heard the sweetest sound, my beautiful baby's cry. Actually it was more like a constant scream. Ha. She wasn't happy to be out! While we were waiting for Dr. Gooding to start surgery, we started trying to guess her weight and height. I said she would be 8 pounds 6 ounces and 20 inches long. Well, she was 8 pounds 4 ounces and they said 19 inches long, but her pediatrician said, they must have measured wrong because at her two week check up she was almost 22 inches long. And she said they don't grow that fast. HA! Terry got to go over and get his second little baby girl and bring her over to me. She didn't want to leave her mama, but Terry and the NICU nurse left out of the OR to get her completely checked out while I was being taken care of. Last time, I was asleep as soon as I saw AC, but this time, I was awake through everything. I remember talking to Dr. Gooding making sure she was getting my tubes removed. And I even asked her if she was using the dissolvable staples like last time. She told me to relax and let her do her job. Ha! They moved me back to my bed, and wheeled me back to my room. Terry was in the room with me a few minutes later with our newest addition, and she was still screaming. I think we messed up her happy place. The nurse came in and gave her a bath in our room and she still screamed the entire time. Poor thing wasn't happy. But, as soon as they gave her back to me, she calmed down and got some sleep. We told my parents they could bring AC by to visit after lunch. Her first time to meet her sister was so sweet. When LP cried, she cried. But she loved touching her and watching her closely. Healing from a second c-section was nothing like the first. I was up and moving a little over twelve hours after surgery. My parents were shocked to see me opening our room door the next morning to meet AC. I had more gas pains this time because I was open longer, but I was back to myself in over half the time this go a'round. We've had our littlest addition with us for over sixteen weeks, and she's such a sweet little girl. The first few weeks were rough because she had reflux and we didn't know it, plus she was colicky. But, we managed to make it through and now, she's the happiest little girl who loves her big sister to pieces! !